The 69th Season, May 24-July 20, 2019, will feature productions of La bohème (in Italian) Die Entführung aus dem Serail (in German with English dialogue) and Adamo’s Little Women (in English). The Studio Artist outreach opera is TBA. Applications will be accepted beginning November 1 with live auditions held in Late November through early February. 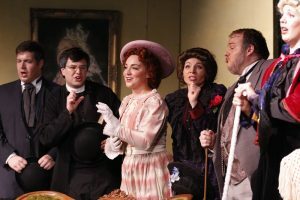 Opera in the Ozarks at Inspiration Point Fine Arts Colony (IPFAC), often referred to as “The Point,” is an intensive eight-week summer training and performance program for young singers, selected from competitive national auditions. Emerging Artists Program: Emerging Artists study, rehearse and perform three operas in fully staged productions with orchestra. Many have the opportunity to perform multiple roles. Because roles are usually only double cast, artists are assured of growing through multiple performances. Emerging Artists also sing in the chorus and participate in the opera scenes program. Some singers may be invited to participate in pre-season publicity programs and early rehearsals beginning mid-May. Studio Artists Program: This program is designed for younger, usually undergraduate vocalists. They are cast in the one-hour outreach production, performed before hundreds of children and families throughout Northwest Arkansas. The 2018 outreach production was Cinderella. 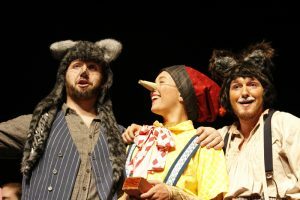 In previous seasons it has been Jack and the Beanstalk, Pinocchio, Cinderella, The Opera Games, When Toys Talk – an English adaptation of Ravel’s L’Enfant et les sortilèges and The Pirates of Penzance. Studio artists often are cast in secondary roles in the mainstage productions, sing in the chorus and are featured in the scenes program. Opera in the Ozarks at Inspiration Point has a venerable, continuous history of training young artists since 1950. No other training institute for young people offers the scope and depth of this total immersion into the process of preparing and performing opera. Alumni of this program now sing in the major opera houses of the world; many others teach at prestigious colleges and universities. Artists are trained, conducted, coached and encouraged by a supportive, professional staff. Included is all training, coaching, workshops, and nurturing required to present opera in full production—scenery, lights, costumes, wigs—accompanied by an orchestra. The season includes 4 weeks of rehearsal, 3 main stage operas in more than 20 performances, numerous performances of the outreach opera and an evening of opera scenes–all presented over a 30-day period. In addition, singers participate in special events such as the program at Crystal Bridges Museum and A Taste of Opera at the historic Crescent Hotel in Eureka Springs. Once the productions have opened, guest artists come to The Point to offer master classes, workshops and classes important to an opera singer’s development. Planned for 2019: vocal master classes, yoga for performers, stage combat, career development, recitative style, role preparation, and more. Additional daily classes and workshops in acting, movement, diction and more are a feature of the final weeks of the program. The cost of the 8-week program is $4750 for the Emerging Artist program, $3500 for the Studio Artist program. The tuition covers accommodations and meals. Transportation to Opera in the Ozarks is the responsibility of participants. If you choose to fly, Northwest Arkansas (Airport code is XNA) is the nearest airport. OIO will make arrangements to pick you up and transport you to The Point.